Eliminate scratches from any wood surface. 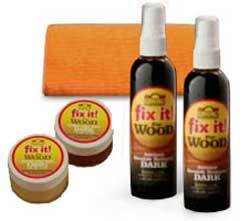 The same makers of the amazing Fix It car scratch repair formula now proudly introduces Fix It for Wood. With Fix It Wood from Simoniz you can quickly and easy eliminate scratches from any wood surface. You just spray on Fix It Wood and then wipe it clean. The scratch will be gone almost instantly. Fix It! for Wood works for all types of wood colors, stains, and grains. It has a light and dark formula for different shades of wood.